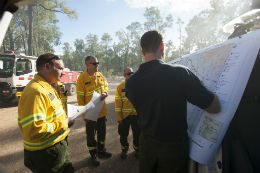 Each year the Parks and Wildlife Service responds to more than 600 bushfires that occur on or near land it manages. Students will be introduced to some principals of bushfire behaviour and the systems in place to respond to these threats. Groups will engage in problem solving scenarios to apply those concepts to simulated bushfire emergencies. COST: Perth metropolitan area, one class (up to 30 students) is $200 per hour or part thereof, second class, $180 per class incursion. Maximum students per group is 30. Multiple groups can be accommodated. Our booking officer will get back to you via email to confirm your incursion including COST within 5 working days.